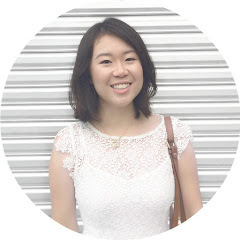 Innisfree was a Korean brand I had never heard of until recently when I started getting more into Korean cosmetics and skincare again and decided to research some of the recommended products out there. One of their bestselling products caught my eye, and as someone who loves face masks, I just had to get this and try it out. Innisfree is a renowned Korean skincare and cosmetics brand which claims to use natural and reliable ingredients in their products sourced from Jeju Island in Korea and promotes an eco-friendly design in their packaging. In fact, the packaging for this product is made using 100% recycled paper and the words are printed with soy ink! Where and What is Jeju island? It is a volcanic island situated off the southern coast of the Korean Peninsula, and is 73km and 31km long in the east-west and north-south direction respectively. If you can see in the first picture, it's written on the box 'scoria and green complex'. 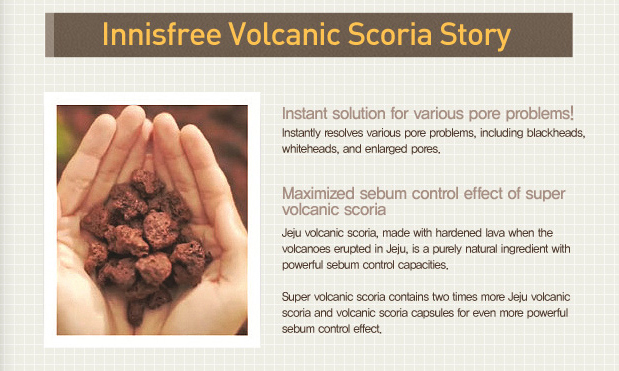 What is scoria, you wonder? 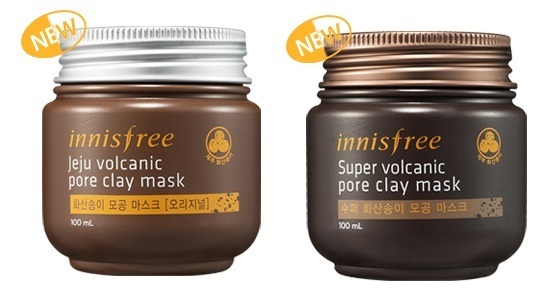 There are two variants for the volcanic pore clay mask and the one I have is the 'super' version, which I randomly chose because I was not sure which one to try hehe! I don't have the original version to compare with but from my research online (after I purchased it- smart), it seems like the 'Super' version is for oilier skin types, whereas the original one is for normal-oily skin. The texture of the two are supposedly different as well, with the original one being soft clay, and the 'Super' version being a harder, thicker clay version. 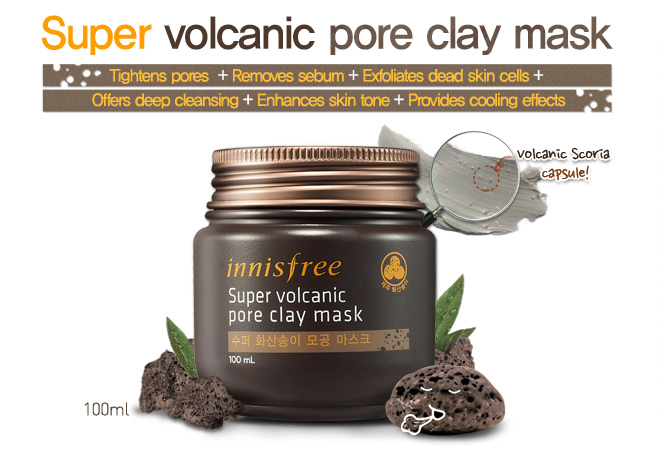 The Super volcanic pore clay mask contains 6,020mg of Jeju Volcanic Pore Clay, and the Super volcanic pore™ absorbs sebum more strongly to get rid of sebum and the impurities of pores. Packaging: The clay mask comes packaged in a very sturdy plastic tub with a bronze coloured metal (not sure if it really is metal) cover with words embossed on it. The tub fits easily in my palm and would be very easy to bring along when travelling as I don't see it breaking or anything bad. Hee! The cover opens up to reveal a plastic divider which I'm guessing is meant to prevent the clay mask from getting dirty. I always ensure I place the plastic divider right back on after I've scooped product out of the tub because I'm paranoid that the air will dry out the clay, but I've had it for about 2 months now and the product still feels the same. Application/Texture/Consistency: This mask has quite a thick texture but I had no problems scooping it out of the tub. Applying it on the face is not a problem, too - it feels and looks like I'm spreading cement (haha!) on my face but honestly, it spreads easily and glides easily on the skin. 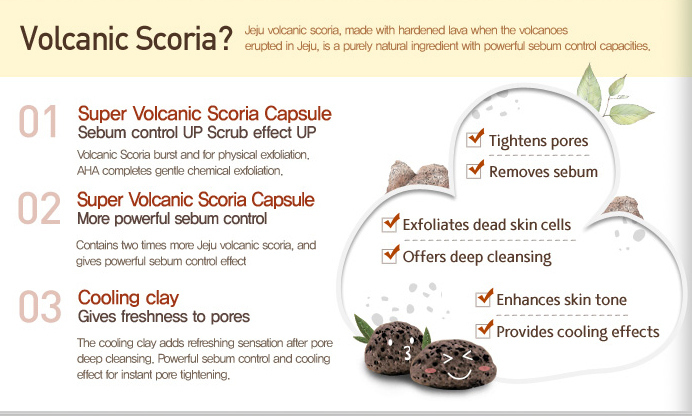 There are little volcanic scoria bits in the clay mask and they feel like grains of sand but they do not rub against the skin. In fact, I barely felt them- could only see them. I also did not need a lot to cover my face, so a little goes a long way. I tend not to apply clay masks all over my face because it is dry and sensitive so I only apply them to areas which have breakouts or where I feel I need my pores to be de-clogged. The recommended time is to apply it for 10 minutes; although I apply it for 20 minutes (I only just realised it was 10 minutes when I saw the pictures for this review!). I find it takes a while to dry, and when it does dry, it is like a typical clay mask where I can't really move my face because it is tight. I then wash off the mask with warm/lukewarm water and the effect is smooth, soft brightened skin. The first time I used it I couldn't stop touching my face after because I was so amazed at how soft and smooth my face felt! My pores also looked cleaner and slightly tighter, although I do not think it got rid of my blackheads or whiteheads. My sensitive skin also experienced no tightness, irritation or breakouts after using this. I like! -- Apply the mask all over your face and wash off after 10 minutes. This will help tighten your pores, improve and brighten your skin tone, and remove excess sebum. -- Apply over your blackheads and wash off after 10 minutes. Then, gently rub and wipe the sebum out of your pores with cotton buds! I tried this and found that it was effective only if I rubbed and wiped pretty hard, which I didn't like so I do not do this anymore. -- Take some product onto a cotton bud and apply it onto your spots like you would with a spot treatment or pimple gel. Leave it on overnight and wash it off to find your breakouts reduced. This was a hit and miss for me. I find that this works well for spots which already have a pus head, but it did not do much for boils or pimples which have not formed a head. Fresh 3M here basically means that the ingredients in the product have been freshly picked within 3 months of it being sold (of course, this only applies only if you purchased it in store. If purchased online like I did, it's definitely more than 3 months). And just in case you're wondering how big the tub is, here's a picture comparing it with my iPhone 3GS. Thought I'd share this because when I received it, I was a little shocked at the size. I mean, I know it's 100ml, and that's not a lot, but I was expecting the tub to be a little bigger from other pictures I saw on the web, so it came as a surprise to me. Would I repurchase?- Yes I would! For the price, I think the product is worth the money and I like how it makes my face feel soft, smooth and clean. It helps brighten my skin tone and although it does not get rid of blackheads or pimples, I feel it definitely helps 'clean' them and soothes my pimples. I would recommend this to anyone looking for a good clay mask! Where can I purchase this?- If you're lucky enough to have an Innisfree store in your country, you can find this there. Otherwise, you can easily find it on ebay. I purchased mine from an ebay seller called sing-sing-girl. Oh and they have a bigger version which comes in a tube! This sounds really, really good! I am currently using Origin's Clay Mask, but it's very expensive. I love trying new products and brands, especially from different countries - it's always exciting to see what else is out there. It is quite good! I have the Origins Clay Mask but don't quite like it as much as I do this one, and yes, it is expensive! That's true - it's really exciting to find out about different products from around the globe. There's so many to try though! this looks like a good mask.. I'll love to try this out..
Ooooh bookmarking this, I definitely want to try it! I have a thing for cleansing masks! Do try it out! Cleansing masks are awesome! It really is good for the price! The Origins mask is quite a famous one! Hope you're liking it! I have a combination skin which my skin are often feel itchy and quite oily. Did you recommend this mask for me?